A relatively new company in the minds of the general public, Mobius and the X8 have actually been worn and tested by Ryan Villopoto since late 2012 and now Ryan Dungey. Slipped on rather than strapped on, the innovative X8 is held in place by a continuous cable and backing plate system that wraps around the leg and provides natural but firm support. Tightened and released by a front dial, the system is extremely easy to put on and adjust throughout the day. Its overlapping joint provides no gap in coverage ensuring roost and the handlebar won’t make contact with your knee. The PIM glass filled nylon construction is very light (a little over 1lb each) and the sleek design makes gripping the bike very easy and comfortable. 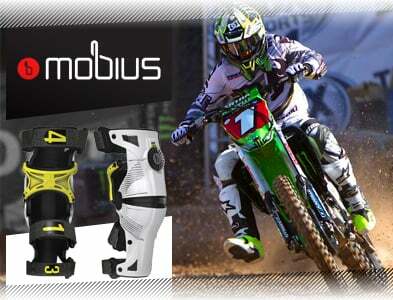 For the serious rider concerned about knee protection, the Mobius X8 knee brace should definitely be at the top of your list of ones to consider. 20% Glass Filled Nylon shells are designed to be flexible in places to allow the shells to conform to the user's leg for a better fit, comfort and stability, and designed to be rigid where necessary to resist excessive movement and provide impact resistance. The Dial, Dial Fastener, Extension Stop, and Hinges are made of CNC Forged 6061 T-6 aluminium for maximum strength. 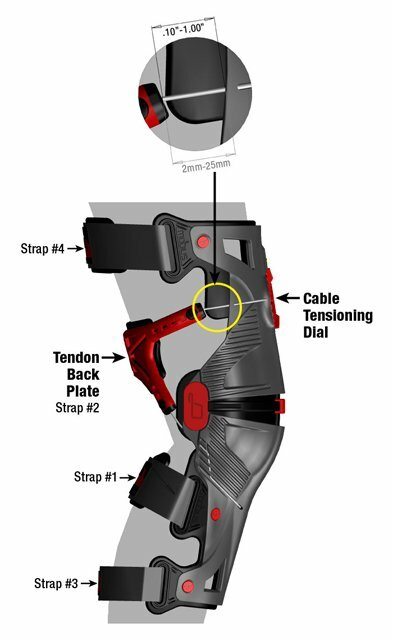 The Tendon Back Plate is uniquely designed to route the cable around the user's leg in strategic locations to reinforce the main ligaments of the knee. The Tendon Back Plate is made from a special flexible Kraton material designed to grip the user's leg and prevent migration. The Foam Padding is made from closed cell ethyl vinyl acetate (EVA) foam. The EVA foam pads are designed to conform to the user's unique leg shape providing maximum comfort and control while gripping the user's leg and preventing migration. Closed cell EVA Foam won’t absorb moisture (sweat), so they are odourless and easy to clean. The CCRS (Continuous Cable Routing System) externally reinforces all of the cruciate ligaments. The continuous cable loop is twisted 180 degrees, or a half turn, to form two interconnecting loops. The CCRS cable is routed around the knee joint and when forces are applied to the knee joint, the CCRS becomes tight and resists the excessive movement that can cause injury to the ligaments. As the Continuous Cable Routing System tightens, it squeezes the brace shells gripping the tibia and femur. The tibial shell is designed to grip the tibial tuberosity controlling the lower leg, while simultaneously the femoral shell and tendon back plate grip the femur. The CCRS cable is routed in such a way that when the leg is fully extended the continuous cable progressively tightens resisting hyperextension, bending, and rotation. When the leg is in flexion, the CCRS cable is designed to progressively tighten as well, preventing rotation and bending. CCRS (Continuous Cable Routing System) adjusts the fit with a single turn of the locking CNC for. If the #2 Tendon Back Plate contacts the shells and will not tighten any further, the brace is too large for you. Using an X8 that is too large for you will not function as designed and will not protect you properly. It may also cause premature wear of the device and may void the warranty. Completely undo Velcro straps #1, #3 and #4. Pull up on the #2 Tendon Back Plate Cable Release Button above the Cable Tensioning Dial and pull out the #2 Tendon Back Plate as far as it will go. Then slide the X8 over your leg and centre the Patellar Shell over your kneecap while bending your leg. The brace should fit snug on the sides of your knee. If it is loose or too snug, choose the appropriate, included Patellar Shell Pad to achieve a snug fit against the sides of your knee. While holding the Tibial Shell firmly against your upper shin, attach Velcro Strap #1 locating the Tibial Strap Pad above your calf muscle and just below the crease behind your knee. While holding the Tendon Back Plate against the back of your thigh and above the crease behind your knee turn the Cable Tensioning Dial clockwise until the cable is tight. After adjusting the Cable Tensioning Dial to your desired amount of resistance, there should be between 0.10" (2 mm) and 1.00" (25 mm) of exposed Cable. If the distance is less than 0.10" (2 mm) or the Cable Tensioning Dial locks out, then try replacing the standard Tendon Back Plate pad with the included thicker Tendon Back Plate pads. If you still can’t achieve the proper tension in the cable, then you need a smaller brace. If the distance is more than 1.00" (25 mm) then you need a larger brace. Attach Velcro Straps #3 and #4 and re-adjust Cable Tensioning Dial, if necessary, so that the Cable is as tight as you can make it without being too uncomfortable. The tighter you make the Cable the better knee protection you will have. To remove the brace first remove Velcro Straps #1, #3, and #4. Then, while holding back the Cable Release Button pull the Femoral Shell away from your thigh until the cable is completely extended and remove the brace. Everyone’s legs are different shapes and sizes and many people have different size legs. 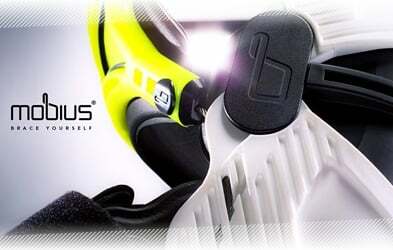 Mobius X8 Braces are completely customizable to accommodate different leg sizes and shapes. Your braces come with two different optional thicknesses of Patellar Shell Pads so that you can get the brace to fit as snug as possible against the sides of your knees. Many people have smaller or larger than normal upper legs and many people have smaller and larger than normal lower legs. To accommodate this Mobius offers Complete Pad Fit Kits for the X8 Braces. For example: If you fit a Small or Medium brace, but your lower leg is relatively larger, then you could replace the Tibial Shell Pads with thinner pads from a Medium or Large Pad Fit Kit. And you could replace the lower Straps with larger Straps from a Medium or Large Strap Kit. The same can be done for the upper leg. Your braces come with optional degrees of extension stops to limit full extension if desired. The extension stop installed on the brace is at 0 degrees, and included are 4, 8 and 12-degree stops.